Welcome to “Beachy Keen”, our beachfront vacation rental condo on Okaloosa Island, FL with a direct Gulf view! NOTE: During Summer (May 18, 2019 - Aug 16, 2019) and Spring Break (Mar 7, 2020 - Apr 17, 2020) we have a 7 night minimum requirement, arriving on Saturday and departing on Saturday. If you create a booking during these dates that does not arrive and depart on a Saturday we will be forced to cancel the booking. Thanks for your cooperation. The whole interior of this condo has been freshly painted with bright, beach-y colors…from the moment you walk in the door you will know that your vacation has begun! 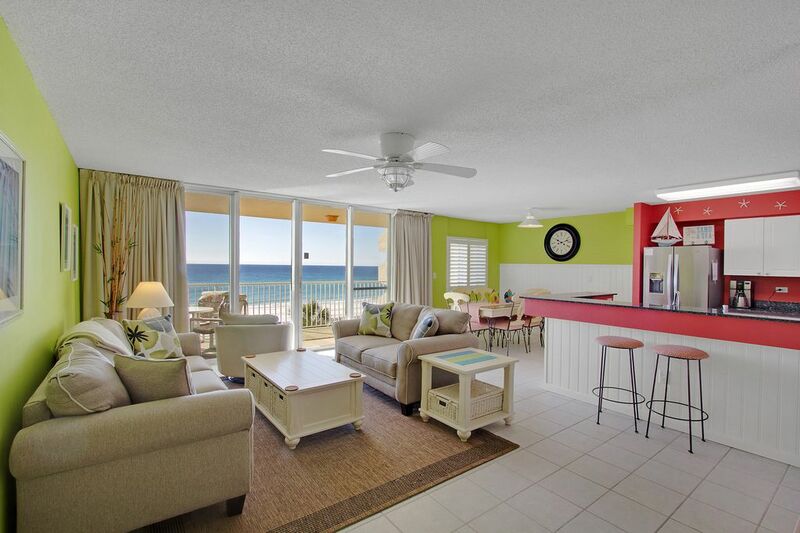 Beachy Keen is our second vacation rental property. Our first is a condo located in the heart of Summit County, CO (VRBO 382), which we bought because of its amazing view of Lake Dillon and the Ten Mile mountain range. We knew that the location and view were what guests would love & why they would want to return again in the future. For the same reasons why we love our CO condo, we fell in love with this unit in Dune Pointe. To begin, at 1285 square feet it was the largest 2 Bedroom/2 Bathroom condo we saw in our extensive property search. There is plenty of room to spread out and relax without feeling cramped or on top of each other. Additionally, Dune Pointe is a low-density building, with only 20 units. This means that our guests will have plenty of room on the private beach since they will be sharing it with just 19 other units, unlike most other condo buildings that have many more units. WHAT THIS CONDO HAS THAT MOST DO NOT: SPACIOUS BALCONY & MILLION $$ VIEW! Because of this building’s location (directly on the beach) our guests have access to the beach just a short walk over the dunes using the private walkway. You will not have to pack up your car to drive to a public beach access, nor carry your equipment, coolers, etc. across a road to the beach. As a service for our guests, your stay at Beachy Keen includes a reservation for two beach chairs and one umbrella set up each day on the beach just for you (March 1 through October 31). Inside the condo you will find all of the comforts and conveniences necessary to make your stay at Beachy Keen feel like home! The master bedroom features a comfortable king-sized bed. You will find a 32” flat screen TV & DVD player in the armoire in this room and an iron & ironing board in the closet. The en-suite bathroom has a jetted whirlpool tub for a relaxing soak after a long day in the sun! There is also a walk-in shower and a vanity with one sink in this bathroom. The second bedroom also features a king-sized bed, making this condo perfect for couples traveling together. This bedroom also has a small TV & DVD player. Right next door you will find the second bathroom, which has a combination tub/shower and a vanity with one sink. Quality linens, bedding and fluffy bath towels, hand towels and washcloths are provided for your use. (We do NOT provide beach towels, however. If you don’t want to pack your own you can buy inexpensive beach towels at one of the many beach stores in the area.) There is a hair dryer in each bathroom. The spacious living area features extra-wide sliding doors that welcome the awesome Gulf view into the room. Here you will find a queen-sized sleeper sofa, as well as other comfortable seating. A large (50”) flat screen smart TV and BlueRay DVD player are available in the living area for your entertainment. The dining table seats six, and there are two barstools at the kitchen counter. The kitchen features beautiful granite counters, brand new stainless appliances and is stocked with dishes, glassware, flatware, pots & pans, coffee maker, toaster, blender, microwave, refrigerator, stove/oven and dishwasher…. everything needed to please the chef in your family! For your convenience there is a stackable washer/dryer in the utility closet. You will also find 2 Beach Chairs & a Boogie Board in this closet for your enjoyment during beach season. A beautiful, sparkling swimming pool is located in the back between the building and the beach. For those who don’t care to sit on the beach there are lounge chairs on the deck around the pool. Please play safely and supervise children at all times; there is not a lifeguard on duty at this pool. There are restrooms available for our guests’ use in the pool area, which means you don’t have to go all of the way up to the condo to use the bathroom when enjoying the beach. When you are finally ready to go inside for the day you can rinse off all of the sand and salt water at the outdoor shower. In the winter the swimming pool at Dune Pointe is heated to 80 degrees when the water temperature falls below that temperature EXCEPT when the air temperature falls below 45 degrees. The pool is not heated when the outside temperature is 45 degrees or colder. NEED MORE ROOM? CHECK OUT OUR NEW “BEACH ESCAPE” CONDO IN THE SAME BUILDING! If Beachy Keen is not available for your dates or if you need more room check the availability calendar for our Beach Escape condo located one floor below this one: VRBO Listing #232742 (purchased on February 1, 2016) or our Beach Bliss condo located one floor above this one: VRBO Listing #1231801 (purchased on 1/4/18). Because of our extensive vacation rental property search in Destin & Okaloosa Island, we are confident that Beachy Keen is one of the most spacious units with the most excellent views around! The direct Gulf views and private beach access are the reasons why we know you will enjoy Beachy Keen as much as we do every time we visit! Please be sure to read our "House Rules" below before booking. After we receive your booking we will call you to answer any questions you might have about this property. We talk to all of our guests by phone. Your booking is not confirmed until we have had at least one phone conversation with you. Caution: We never advertise our property on Craigslist! We are Redgie & Valerie and live in the beautiful state of Colorado! We love to travel and experience new adventures as often as possible. Valerie has been involved in the vacation rental industry since 2002 (a former employee/Manager at VRBO/Homeaway until she retired in 2013.) We bought our first vacation rental property in Summit County, CO (VRBO 382) and now are happy to own three beachfront condos in the warmer climate of Florida (VRBO 2462, 232742 & 1231801)! Our fifth vacation rental (VRBO 1083701) is a home in Lynchburg, VA. We have loved sharing our homes with our guests over the years. We chose this property because of its location on the small, less-congested Okaloosa Island. We love that Dune Pointe is a small, low-density building (with just 20 units) which means more room on the private beach for owners and guests. The real reason we were drawn to this unit was the million $$ views of the beach and the Gulf from the balcony of our unit! Just like our CO mountain condo on the lake, we knew we could change everything about the condo except its location and view! We love relaxing on the balcony watching the dolphins play in the surf of the turquoise waters and listening to the sounds of the waves washing upon the sugar white sands on the beach! Direct view of the beach, Gulf and emerald green waters from the balcony of our unit! Pool is heated to 80 degrees when the water temperature falls below that temperature EXCEPT when the air temperature falls below 45 degrees. The pool is not heated when it is below 45 degrees outside. Our best beach vacation yet. Everything about this place was wonderful for our family. The beach, views and accommodations were great. It was very spacious for our family of four. Thanks to the well-stocked kitchen, I discovered I needed a shrimp peeling/deveining tool! We can't wait to come back. This was without question the nicest property I have ever rented. Valerie was so accommodating and easy to work with. Brachy Keen was roomy, clean and decorated so beautifully. We are definitely coming back. This condo was clean and fully stocked even with extras. This condo was perfect for our family! Clean, neat and had all the amenities we needed. The furnishings were up to date and beds were comfortable. We had beach service with two chairs and an umbrella, but #401 also had two extra chairs and two boogie boards for our use. We loved that Dune Pointe is a low volume building, which allowed us plenty of room at the beach and on the elevator. We plan to rent #401 again! Valerie was very accommodating and I appreciated her detailed information concerning the condo. Great, quiet location for a restful week. My sisters and I enjoyed our trip at the condo. The condo is clean, well stocked, and a great location on the beach. The only thing missing were dish clothes and basic spices for cooking… But other than that, it was great to have Tupperware, kid dishes and extra bath towels. It was enjoyable to sit on the balcony and play on the beach without the crowds. The only confusing part was that two buildings had the same address and fatigue and sickness got the best of us. The owners were just a phone call away and that was very much appreciated. In nearby Destin you will find attractions such as the Big Kahunas Water Park, Destin Fishing Museum, Silver Sands Outlet Mall, Go Carts and more! Monthly rentals accepted only during the months of January & February. Damage Waiver Fee is non-refundable.